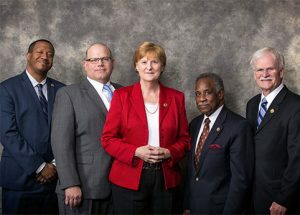 Henrico County was one of the first localities in Virginia and the nation to adopt the County Manager form of local government. This consists of a Board of Supervisors, which is the policy-making body of the County, and a County Manager, who is the administrative head of the County. This form of government consolidates the administrative functions of the County into departments. The heads of most of the County’s departments are appointed by the County Manager. 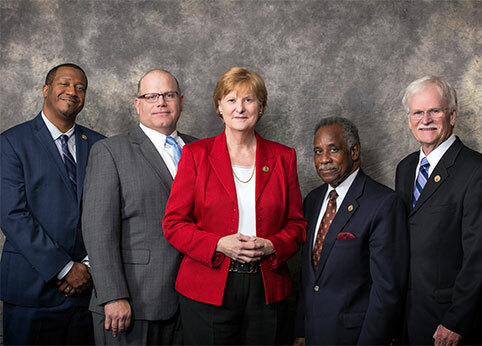 The Board of Supervisors is the elected governing body of the County and is responsible for establishing policy within the framework of the Constitution and Code of Virginia. It adopts the annual operating and capital budgets and appropriates all funds for expenditure. Board members are elected to four-year terms by the voters in each of the County’s five magisterial districts: Brookland, Fairfield, Three Chopt, Tuckahoe, and Varina. The Board appoints the County Manager, who is the chief administrative officer of the County. Our County Manager, John Vithoulkas, is responsible for executing the policies established by the Board of Supervisors and for advising and recommending actions to the Board to meet the needs of County residents. In addition to administering the day-to-day operations of the County, he serves as the Director of Public Safety and Special Services. The County Manager’s Office includes four Deputy County Managers who assist Mr. Vithoulkas with planning, organizing, and administering the activities of the County. To find out about the department for which you will be working or to learn more about other County departments, please see this list of County agencies. The County has a rich history which predates back to 1607 when Captain Christopher Newport sailed to an area occupied by Native Americans to explore new land. He was the first Englishman to set foot on soil that later became Henrico County. 1611 is a significant date because that’s when Henrico became a city. Later, in 1634, Henrico became an official county. The County is widely recognized for the marriage of John Rolfe to Pocahontas, who was instrumental in establishing peaceful relations between the Native Americans and English settlers. The County recognizes its rich history and is creating a culture that our honors the past, while preparing a pathway for the future.